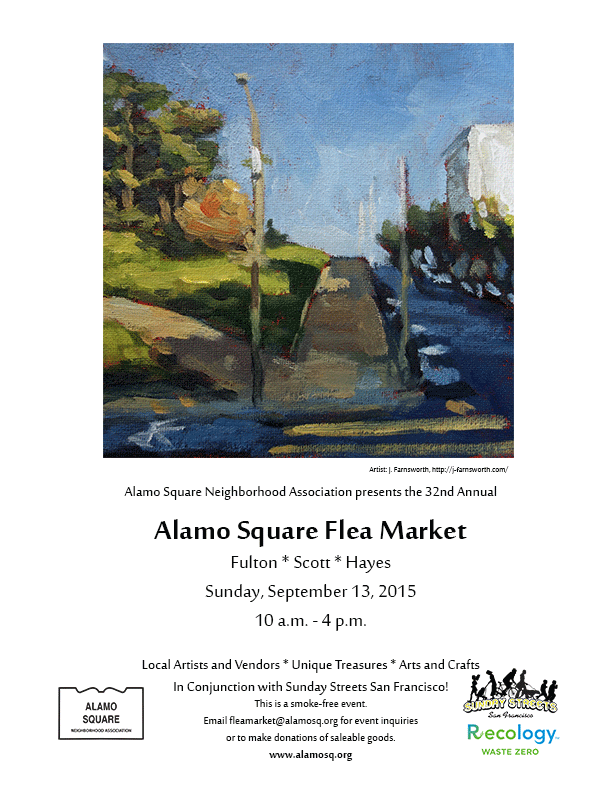 The annual Alamo Square Flea Market will be held on Sunday, September 13, 2014 from 10 a.m. to 4 p.m. in conjunction with Sunday Streets! We are looking for volunteers to help us staff the event. If you are interested, email us at volunteers@alamosq.org and let us know you want to help at the Flea Market! Vendors: Spaces will be sold along the Sunday Streets route on Fulton Street ($70), where the street will be closed, though there is a flat incline — no canopies are allowed. We will sell spaces along Scott Street ($100), our flattest space, only along the sidewalk adjacent to the park. We will also sell spaces along Hayes Street ($40), which has the steepest incline. Due to the number of applications we receive, we may not be able to accept all vendors. View the Vendor form here. If you have any questions, comments or suggestions, please contact fleamarket@alamosq.org. Email donations@alamosq.org to contribute to this year’s Donation Booth.